Way back in October or November time last year, Paul asked me to book some time off work. He wouldn't tell me where we were going, or if we were even going away, just that it was a surprise. I kept trying to get it out of him, but he wasn't having any of it! He kept it a secret from me until one day in March when I asked him to give me a clue about the surprise. He mentioned padlocks, which straight away made me think of Paris, as we went a couple of years ago and attached a love lock to the bridge. I wondered out loud if we were going to Disneyland while we were there, as we'd been to Disneyworld Florida in September and it's safe to say we were both looking forward to our next dose of magic - so I was really excited when Paul told me that's what he had planned! We flew to Paris on 1st July after travelling to the airport in First Class on the train - free tea, yay! On our first night we just went to get some food and settled in. We only had tickets for one day so we'd planned to get up nice and early to make the most of it, and we were there pretty much in time for the park opening. There were quite a few people around but because it was just before the school holidays, it wasn't super busy. Minnie Mouse ears already firmly in place, we wandered down Main Street and looked in a few shops before stopping in front of Sleeping Beauty's castle for photos. Paul took a few photos of me and then we swapped cameras so I could take some of him before we started looking around for someone to take one of both of us with the castle in the background. We milled around in front of the castle for a while and he would occasionally point out people who might be able to take our photo, but didn't really approach anyone to ask them. It wasn't my camera and I was just happy to be there so I just kind of left him to it and took a few of my own photos of the castle while we were waiting. Eventually, a couple approached us to take their photo for them which Paul did, and I took the opportunity and asked them to take ours. After that, I was satisfied that we'd got all the photos we needed and we could wander off and explore the rest of the park, but Paul was really reluctant to move away from the castle. I think it was at this point that I started noticing him acting a bit strangely, still looking around for someone to take another photo of us even though the couple had taken some good ones. After a few minutes still hanging around, I decided that I was actually pretty hungry as we hadn't really eaten before we left the hotel, so we wandered back down Main Street and picked up a croissant. Paul said he wasn't hungry despite having no breakfast - that's when I should have really known something was going on! We walked back to the castle and I assumed we were heading for the rest of the park, but Paul was still hanging around. I actually started to get a bit impatient (I really wanted to start going on rides, poor Paul!) Eventually, he asked me to stand by one of the railings in front of the castle and he approached a nearby girl to ask her to take our picture. Now, he was talking to a her for what seemed like a really long time, definitely far too long to just be asking her to take a picture, so at this point I had more than an inkling that he was up to something. The next part is kind of a blur, actually! 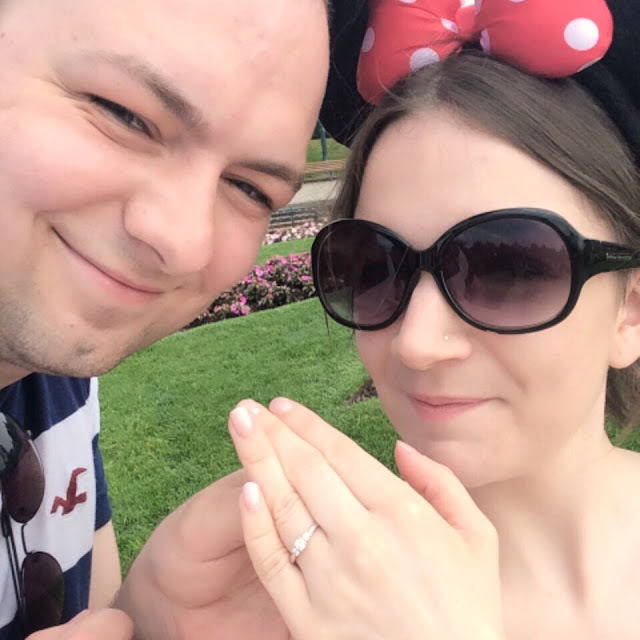 As he came back over to me he was pulling his rucksack off his shoulder, and instead of putting his arm around me or posing for a picture, he got down on one knee and asked me to marry him. We both started crying pretty much before he'd even got the question out, and then I cried even more when I saw the ring! I didn't say yes, I said 'of course I will!' and there was lots of hugging and crying and a very nervous Irish girl who wished us congratulations after having nearly crumbled under the pressure of capturing our special moment for us! I couldn't stop crying happy tears for ages and of course I had left all my pocket tissues at the hotel, so the next few minutes was a fun game of trying to locate some in Disneyland, where none of the staff knew what we were talking about - the French for tissues is not 'papier pour le nez' but Paul repeating this to the bemused guest relations lady definitely gave me the giggles. We spoke to both of Paul's parents on the phone pretty much straight away, but getting hold of my family was a different story entirely. Neither of my parents would answer their phone, and I wanted to tell them first before I put anything on any social media. Of course my Dad already knew as Paul had been to ask his blessing which I think is lovely, and eventually we managed to get hold of everyone important. I spent the rest of the day in Disneyland questioning Paul incessantly, I wanted to know everything - when did you plan it, how long have you had the ring, who did you tell first, what did they say, did this person cry, were they happy, etc. etc. but we had a really fun day and it was finished off perfectly with the fireworks display above the castle in the evening. The next day we went into Paris which was lovely too. Our first stop was Lover's Bridge where, after some pretty frantic searching on Paul's part, we found our padlock that we had attached almost exactly two years before! We were so happy it was still there, as we'd seen in the news about the decision to cut them all off. We might not be so lucky another time, but it was pretty special to see it on this trip. 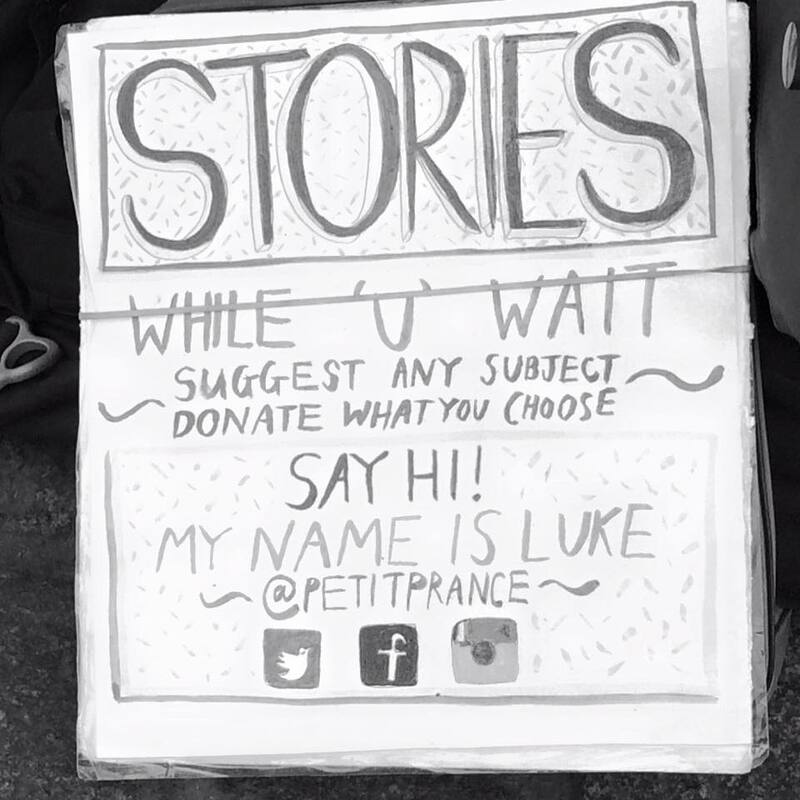 Then we visited one of my favourite spots, Shakespeare & Company book shop, where we met Luke who makes a living writing stories for passersby while they wait. 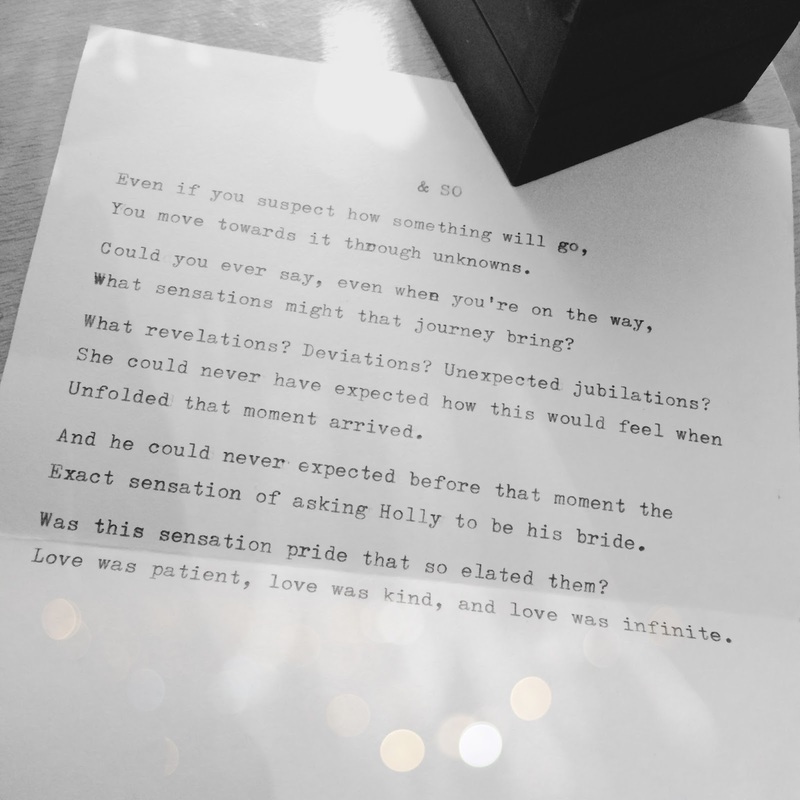 He wrote a story for us about our engagement, which is such a lovely, unique keepsake, it was good luck he was there on the same day as us! So we've been engaged for nearly 2 months, and so far I haven't been able to stop admiring my ring every chance I get. It's so beautiful! It's actually one that I pointed out in the window of the jewellery shop and declared to be the prettiest ring I'd ever seen, and I know now that he went back the same day to pay the deposit. But that's another story, one which I'm going to let Paul tell in his own post! 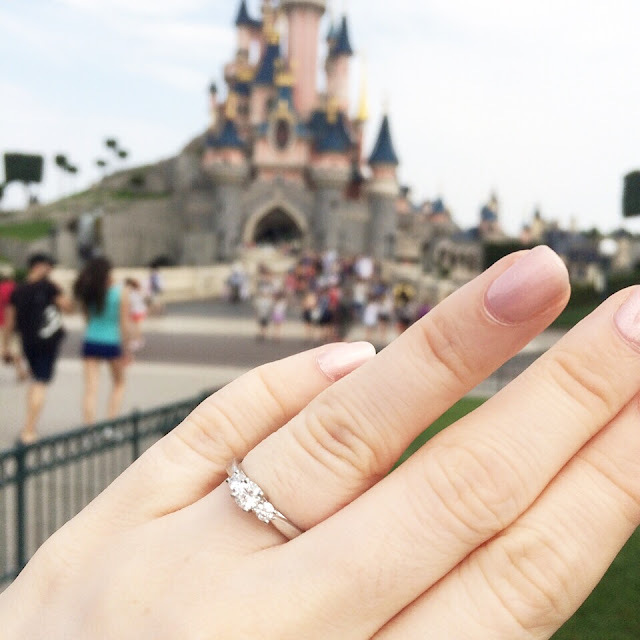 As for the proposal itself, I couldn't think of anywhere more perfect than Disneyland. It really was magical, and I can't wait to be Mrs Dickenson. 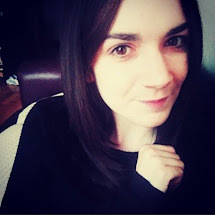 Sociology graduate, unexpected Gryffindor, work in progress. Happiest with my nose in a book. Copyright Holly Thomas 2014. Powered by Blogger. © HOLLY POCKET. All rights reserved.